Everything comes at a price. The currency, however, varies. The Runaway Jury demonstrates this with clinical precision as it takes you through the dark world where deceit, extortion, blackmail and bribery are traded for favors. The movie does not enhance the taste of your popcorn. If anything, its brilliant premise makes you forget all about it, and the crackerjack script turns into a scorching potboiler that compels you to think. When a stockbroker is gunned down in an incident of office-rage, his wife takes on the gun manufacturer in a precedent-setting legal battle that reeks of sabotage. At the eye of the storm are twelve men and women who have been investigated, watched, manipulated and harassed by high priced lawyers and consultants. And by one of their own. Nicholas Easter (John Cusack) is the mole who is determined to control the verdict, and a beautiful woman, Marlee (Rachel Weisz), is determined to control him. Well, in the immortal words of Rankine Fitch (Gene Hackman), "Trials are too important to be left to juries". So, Fitch, the defence attorney working the case for the gun consortium, also takes it upon himself to ensure that justice is delivered in favor of his client. And there is no line he won't cross. With his team of sleuths and spy-gizmos, he sets up his game of applied psychology, and the skeletons just keep tumbling out of the closet. At the other end of the spectrum is prosecutor Wendell Rohr (Dustin Hoffman), whose idea of manipulation is spilling mustard on his tie. Almost immediately you are trembling in anticipation of a Hoffman-Hackman encounter - a titanic clash never seen before. And when it does come, you feel a little betrayed as Hoffman seems almost demure. Well, round one to Hackman. The Runaway Jury leaves you breathless. It moves at a break-neck pace that gives you no time to wonder about some of the holes in the plot. It also generates a frenzied, almost chaotic momentum which, I suspect, is the result of trying to beef up the character played by Hoffman. In the book by John Grisham that the film is adapted from, Rohr's is a character that does not merit more than a passing mention. At any rate, after coming up with thrillers like Don't Say A Word and Kiss The Girls that had you sitting at the edge of your seat, this is a disappointing endeavour from director Gary Fleder, but the powerful performances from Hackman, Hoffman and Cusack, almost adequately, compensate for the glitch. Through the entire flick, you find it difficult to decide whom to laud and whom to condemn to damnation. Disappointingly, this confusion is resolved explictly at the end by taking away the shades of grey that makes the characters seem real, and the element of dark intrigue that makes them fascinating. Be the first to comment on Runaway Jury! Just use the simple form below. fullhyd.com has 700,000+ monthly visits. 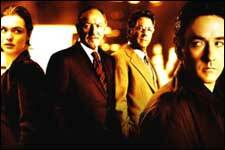 Tell Hyderabad what you feel about Runaway Jury!